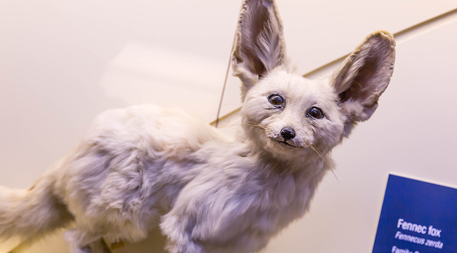 Once viewed as esoteric collections of dead and dusty things, natural history museums are finding new life as windows into the past of a changing world. December 21, 2017 — In 1893, a collector caught a bee. Dried for preservation and pinned to a board, the insect, a solitary mining bee, has spent decades in a museum collection in the United Kingdom. Today, that bee is busy again. It’s among hundreds of specimens from two British collections — at the Natural History Museum in London and the Oxford University Museum of Natural History — used in research revealing that this species has become increasingly out of sync with the orchid that needs it to carry pollen from one bloom to another so it can reproduce. Researchers note when each insect specimen was collected, which gives them a good idea of when bees started flying each year. For orchid specimens, it’s a similar deal: prior research demonstrated that the date on which a plant was collected tracks pretty well with the species’ peak flowering time that year. The study’s conclusion? Warmer temperatures have spurred the bee to take flight earlier each spring, and while the orchid is responding to the temperature shift as well, its flowering time hasn’t moved up the calendar quite as quickly. The study is the first backed by long-term data to demonstrate the potential for climate change to disrupt the delicate evolutionary balance between plants and pollinators. In using dead specimens to explore climate change, the study is an important reminder that natural history collections — cabinets and drawers brimming with carefully identified and preserved animal carcasses or plant parts, housed by museums and universities around the world — are far more than collections of curiosities. They not only provide a unique and critical window into the past — including discovery of species that have not been described before — but they also can help us understand the present and see our future under climate change. “It’s a very underexploited resource,” says Anthony Davy, an ecologist at the University of East Anglia in the U.K., who worked on the bee/orchid study. But over the past 10 to 15 years, use of biological collections to explore questions related to climate change has grown. Collections let researchers rewind the clock to track how historical shifts in climate have transformed the timing of biological events, such as when plants flower. Biologists investigating climate’s relationship with plant and animal life cycles can only get so much information from observations made in real time because the long-term data required for climate research take decades or more to gather. 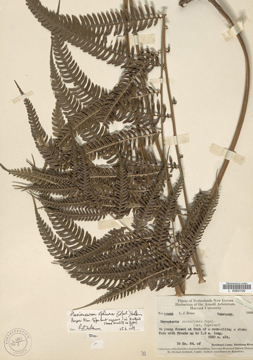 Specimens in collections can fill gaps left by notes from the field. 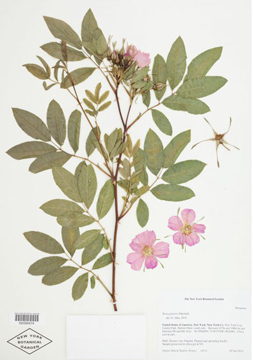 At Harvard’s Arnold Arboretum, for instance, biologists from Harvard and Boston University looked at specimens from the herbarium — a collection of dried plants — to see what time of year they flowered. By comparing these records with living plants from the arboretum’s botanical garden, the researchers gleaned insight into how those species have reacted to climate change. In a similar study, scientists from China and Nepal examined some 900 plant specimens amassed since 1961 and found that vegetation in Tibet has been flowering earlier and earlier. Another research project examined how recent changes in Colorado’s climate have influenced the evolution of alpine butterflies. Collections can also help scientists sketch future prospects, forecasting whether and how organisms will be vulnerable to coming climate change. To discern future impacts, we first have to know where species exist now and how their range has changed already, says Barbara Thiers, director of the William and Lynda Steere Herbarium at the New York Botanical Garden. “That information is obtainable, really, only from the specimens,” she says. In 2015, researchers used museum collections, with some specimens dating back to 1895, to project how California redwoods might fare as temperatures keep climbing. Because they grow along the Pacific Coast, redwoods are sensitive to fine-scale interactions between the atmosphere and the ocean. That means local data are important for making climate adaptation and conservation plans. Relying on such data is tough, because standard approaches to adaptation and conservation use global-scale climate simulations. But high-resolution historical climate data, paired with museum specimens from the same span of time, gave the researchers a workaround. With specimens from over a dozen herbaria, they mapped the redwoods’ current range and built a computer model simulating the near future. The model predicted that as temperatures warm over the next two decades, redwoods will retreat to colder climates, losing suitable habitat in southern California while expanding northward. Collections data are useful in broad assessments, too. In the early 2000s, a team of researchers set out to project how climate change might transform ecological communities in Mexico. Forty-five natural history museums from across the globe gave Mexico’s National Commission for the Knowledge and Use of Biodiversity (CONABIO) distribution data from more than 110,000 mammal, bird and butterfly specimens collected in Mexico. The research team used the data, alongside environmental data and climate scenarios, to project how those species might fare come 2055. While the study doesn’t anticipate much extinction, it does warn of potential for “severe ecological perturbations” resulting from high rates of species turnover. As useful as collections might be, working with them is, at times, like herding a gaggle of toddlers. Every data point wants to wander off in its own direction because collections are a mishmash of specimens taken at different times and places for different purposes. For one thing, what’s in a collection is no more, or less, than whatever some past collector decided to deposit. With greenery, for example, common and conspicuous plants growing in clumps tend to be picked — and so end up in herbarium collections. Because studies of climate change are intimately tied to time, temporal bias can also be a pain. A researcher might find, for instance, drawer after drawer holding year after year of squirrel specimens — a record that stops the year funding dried up or the moment a graduate student finished a dissertation. Geography also matters. In Australia and South Africa, for example, hot spots for collecting are near the coasts. And worldwide, there’s a relative dearth of specimens from tropical and subtropical areas. But these hurdles aren’t insurmountable. “Because museum records and herbarium records can actually produce such large quantities of data, you do have the statistical power to look for the underlying signal,” says Davy. In other words, one or two data points could lead researchers astray, but collections contain enough specimens for scientists to see real trends. Funding and support, then, may be the bigger problems. Over the past 20 years, more than 100 herbaria across North American have closed. As budgets have been cut, natural history museums have cut staff, too, resulting in situations where major institutions like the American Museum of Natural History lack dedicated curators for whole classes of animal. One university eliminated its collection to make room for enlarged track facilities. Despite these challenges, researchers continue to innovate. A new front for museum-based research is citizen science. In a paper published earlier this year, a group of Harvard biologists teamed up with the University of Waterloo’s Human-Computer Interaction Lab to crowdsource herbarium specimen data for climate change research. The team took photos of dried plants from collections around New England and uploaded them to CrowdCurio, a science crowdsourcing platform created by the University of Waterloo computer scientists. When the research team paid nonexpert workers to count the number of flower buds, open flowers and fruits on each specimen, they discovered that, while experts assessed data more quickly, pooled data from the nonexperts wasn’t any less accurate — though it was a lot cheaper. By looking at numbers for different traits from different stages of the plants’ life cycles, the research showed that crowdsourcing can provide the volume of data needed for a more nuanced evaluation of how species react to changes in temperature than standard single-trait studies offer. Such methods make collection-based research even more powerful, helping scientists answer questions more quickly. And for an issue like climate change, for which the clock is ticking, every minute counts. 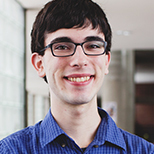 Editor’s note: Andrew Urevig produced this feature as a participant in the Ensia Mentor Program. His mentor for the project was Greg Breining.